None of them 2 years old yet! 5 Birds Pointed in that shrub. A great way to finish this trip! We put all four pups on the ground and hunted a honey-hole we found earlier in the trip. 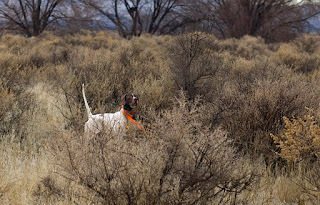 Action started heating up about an hour before sunset with two covey finds and numerous singles pointed. 30 minutes after the pups pic, it was time to return to the truck. Awesome finish to a great hunt. The most memorable thing about this trip is the great people we met! We hunted with some real gurus- chukar, valley quail, Huns- some real specialists. The one day I hunted Chukar, this young buck mountain goat showed up and took me in areas I'd never go. I got to admit, I was one worn out bird hunter at the end of that day! He had us over to his house later for dinner (big slab of grilled Idaho salmon) and we met his lovely wife and children and listened to the Snake River shoosh by while we told tall tales and lies about bird dogs and hunts. Finally, I was falling asleep listening (anyone who knows me would understand, it was almost 10pm, after all) and Robert suggested we needed to get back to the motel. Another good friend invited us up to Sun Valley to meet yet another couple and we all went out to eat. It was snowing so hard, we stayed over at their home (on a 7000 ac. ranch with elk, deer and wolves) and left in the early morning to beat the next storm. Several new friends offered to take us around the area and we just had no time to do it. What a wonderful problem to have. You all know who you are, so thank you so much for your kindness and generosity! All of this came about through our contacts on Facebook (yes, even worn out bird hunters are on Facebook) in a Group called "Bird Dogs and Fly Fishing". It is a closed group, which means you must be invited by someone you have "friended", who is already in the group. I think you can also go to the group and request to join. The pictures and discussions are friendly and helpful (I changed several things I do, based on advice from bird hunters all over the country). Give it a look and see what you think.